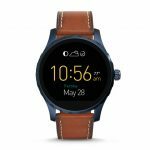 The Fossil Q Marshal smartwatch is from the renowned wristwatch company. It�s one of their first forays into the world of �smart� watches. The Fossil Q is powered by Android Wear, so the experience is similar to other AW watches. It offers activity tracking, smart notifications, and a 24-hour battery life. It�s compatible with both Android and iOS smartphones. It also has a mic and speaker for voice commands.